Tucked away in the trees, just out of sight of one of the busiest commuter corridors in the US (along US 301 and US 50 east of Washington, DC), you can still find a spot of wild refuge. The Patuxent River is the longest river wholly contained within the borders of Maryland, and along its 115-mile course transforms from a rocky creek to a tidal estuary and major tributary of the Chesapeake Bay. 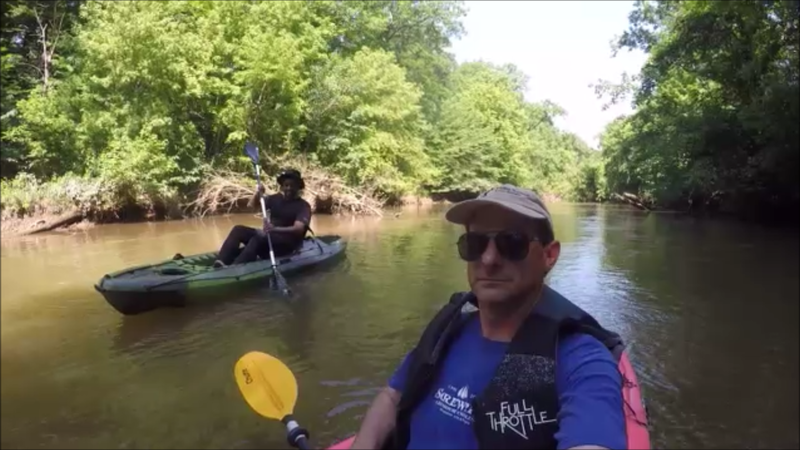 After meeting via YouTube and Instagram, a new friend, Yak Cruisin and I decided to rendezvous and check out the middle stretch of the river, near Bowie, MD. There are four good river access points in this ~7 mile stretch: Governor’s Bridge Park, Davidsonville Park, Queen Anne’s Bridge, and Wooton’s Landing. Each of these has parking for a few cars and easy put-in/take-out access. There’s also what I would call an “emergency” access point at the Rt. 214/Central Avenue bridge – not great access but it will do in a pinch. We had to use it, and it’s steep, rocky, full of trash, and along a narrow shoulder on a busy road. Wooton’s Landing. Notice how much wider (and clearer) the river is here. It is tidal not too far downstream. Our put-in was Governor’s Bridge, and we planned to go all the way to Wooton’s Landing. River level was right at 5.5 feet on the US 50 gauge in Bowie. The current was surprisingly brisk through here – fast enough that while paddling upstream was possible, it was a bit of a workout. Approaching the Rt. 214/Central Avenue Bridge. fairly high and steep. None of it was hard, but it did slow us down and require some creative route-finding. Because of the slower pace, we wound up taking out at Rt. 214 – but we understand the river is clear (or was) all the way from 214 to Wooton’s – which makes sense, as the river starts to widen and become tidal just below Wooton’s, toward Patuxent River Park. Though the going was slow, the river was beautiful. It needs a little TLC in terms of collecting litter (cans, bottles, a tire or two) – but it’s still full of wildlife. We followed a pair of herons for miles, saw hawks and bald eagles, groundhogs, and one beaver that swam across the river before tail-slapping and diving when we got too close. Since our trip didn’t go to plan, we’re thinking about how to hit the stretches we missed. It’s a nice escape, and we’ll definitely go back! Distance: 4.5 miles. Extend another 2 miles and go to Queen Anne’s Bridge, or another 4 to Wooton’s Landing. Google Earth overview of our route. The town on the left (west) edge is Bowie, MD. That was fun. My daughter and family live in Bowie. They have 5 kids from 7 up to 20. I doubt if they know this environment exists right under their noses. I will give them a link to your post. Small world! I live a bit south, down where you can sail on the Patuxent, and disappointed it’s taken me so long to get up to this stretch! Thanks!